"Sampath Speaking" - the thoughts of an Insurer from Thiruvallikkeni: Airline mix-up ......... confusion in names of places - Geography !!!! Airline mix-up ......... confusion in names of places - Geography !!!! Chennai Airport is “MAA” ; LHR is not Lahore but London – Lahore is LHE. Unlike the Motor, Health, Property Insurer – Marine Insurer has the burden of knowing geography – having to deal with various places in the World. Some lesser known little countries – their geo political conditions and more …. Heard of ‘Aruba’ - a 33-kilometer-long (20 mi) island of the Lesser Antilles in the southern Caribbean Sea, located 27 km (17 mi) north of the coast of Venezuela. Together with Bonaire and Curaçao, it forms a group referred to as the ABC islands of the Leeward Antilles, the southern island chain of the Lesser Antilles. Collectively, Aruba and the other Dutch islands in the Antilles are commonly referred to as the Netherlands Antilles or the Dutch Antilles. Furthermore, Aruba is one of the four constituent countries that form the Kingdom of the Netherlands, along with the Netherlands, Curaçao and Sint Maarten. The citizens of these countries all share a single nationality: Dutch. Holland is a region and former province in the western part of the Netherlands. The term Holland is also frequently used to refer the Netherlands. Amsterdam is the largest city and the capital of the Netherlands. Amsterdam's name derives from Amstelredamme, indicative of the city's origin: a dam in the river Amstel. The confusion is – when somebody asked for coverage to ‘Netherland Antilles’ – a policy was issued with destination as ‘Nederlands’………….. Netherlands Antilles is an autonomous Caribbean country. When the Wright brothers or Tata took to the air, there was no need for coding airports since an airport was literally any convenient field with a strong wind. Then came the Airport codes for easy (!) identification – not only for people – more for cargo. Now we have 3 digit codes. An IATA airport code, also known an IATA location identifier, is a three-letter code designating many airports around the world, defined by the International Air Transport Association (IATA). The characters prominently displayed on baggage tags attached at airport check-in desks are an example of a way these codes are used. Many station codes are simply the first three letters of the city name: ATL is Atlanta, BOS is Boston, SIN is Singapore, and SYD is Sydney, Australia. Sometimes the city name lends itself to one letter for each word - Port of Spain in Trinidad & Tobago (POS), or even Port au Prince, Haiti (PAP). Some you may never be able to say how or why - LGA stands for LaGuardia in New York, HOU is for Houston's Hobby Airport; SLC is for Salt Lake City, ORD for Chicago O'Hare. In India BOM is Mumbai Chattrapathi Shivaji International Airport; HYD is Hyderabad Rajiv Gandhi International Airport; MAA is Chennai Meenambakkam International; CCU is Kolkata Netaji Subhash Chandra Bose International Airport. Some have suffix X for they were earlier two letter codes. Here is an interesting mix-up as reported in Daily Mail May 2013 – when a couple arrived in Dhaka, Bangaledesh – 7000 miles away from where they intended. A couple who planned to fly from Los Angeles to Dakar, Senegal, found themselves 7,000 miles away in Dhaka in Bangladesh after an airline mixed up their flight. Sandy Valdiviseo and her husband Triet Vo intended to take a Turkish Airlines flight from Los Angeles to Dakar but an airport code mix-up saw the couple sent to the wrong continent. The airport code for Dakar is DKR, while the code for Dhaka is DAC. The couple flew from Los Angeles to Istanbul and had a four hour stopover. They then boarded a plane for the final leg of their journey and did not realise anything was amiss. 'When the flight attendant said we were heading to Dhaka, we believed that this was how you pronounced Dakar with a Turkish accent,' Valdivieso told the Los Angeles Times. 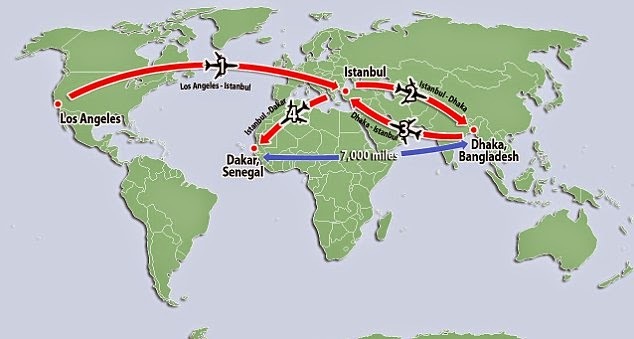 They only realised when they saw a map of the flight's route in the air that they were on their way to Bangladesh instead of Senegal. After arriving in Bangladesh, it took nine hours for the couple to secure flights to Senegal. The carrier insisted on listening to a phone recording of Ms Valdivieso booking the flight to Dakar before they admitted they had put wrong airport code had been put on their tickets. There was no extra charge for the flight from Bangladesh !! – and their luggage which also traveled to Bangladesh arrived in Senegal two more days later. They had to battle for 4 months to receive compensation from the airline over the incident and eventually were offered two free tickets to anywhere on the Turkish Airlines' network. Getting back to Aruba detailed at the start of the post, became a separate country within the Kingdom of the Netherlands in 1986. The rest of the Netherlands Antilles was dissolved on 10 October 2010, with Curaçao and Sint Maarten becoming two new constituent countries and with the other islands becoming special municipalities within the Netherlands. 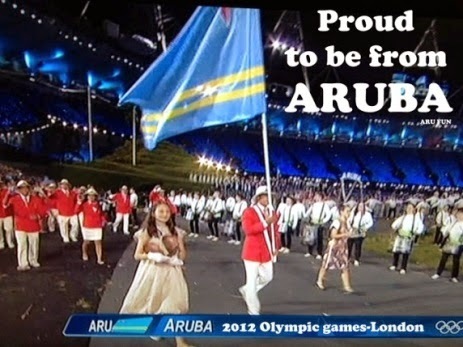 Aruba competed at the 2012 Summer Olympic Games in London, United Kingdom as an independent nation.